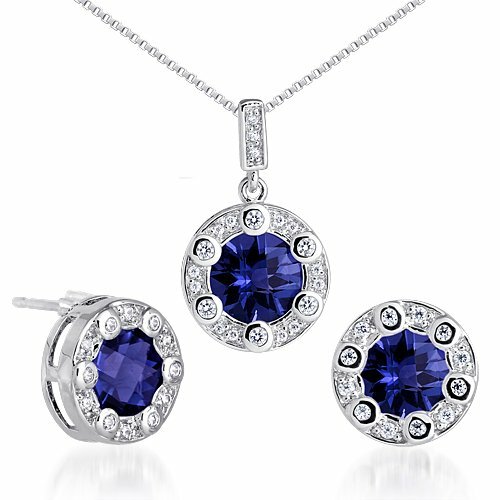 Round Checkerboard Shape Created Blue Sapphire Pendant Earrings Set in Sterling Silver Rhodium Nickel Finish Earrings: Created Blue Sapphire: 2 pieces, Round Shape, 7.50 mm. White Cubic Zirconia: 24 pieces, Round Shape 1.40 mm. Dimension: 1/2 x 1/2 inch. Pendant: Created Blue Sapphire: 1 piece, Round Shape, 10.00 mm. White Cubic Zirconia: 6 pieces, Round Shape 1.90 mm. White Cubic Zirconia: 15 pieces, Round Shape 1.10 mm Dimension: 1 x 5/8 inch. Earrings & Pendant have a total weight of 6.95 grams and are set in pure .925 Sterling Silver Rhodium Nickel Finish. From our Couture Collection, Set features ""one of a kind"" design with a beautiful ""White Gold"" finish featuring Gemstones with a gorgeous deep rich color, vibrant luster and clean clarity. MSRP $117.99 Includes a 18"" Sterling Silver Rhodium Nickel Finish Box Chain, Money Back Guarantee, Signature Gift Box!!!! !